My name is Katie. I recently moved to Lake Glenville in North Carolina. I grew up in these mountains, but I have been living out in Washington state for the past several years. It is a bit of a culture shock coming back to the South, but at the same time this area will always be home. My husband is an artist, and I am a writer. This year we want to get out and do more in our area. Lake Glenville is close to Cashiers and Highlands: two pretty little mountain towns full of unique shops and events. 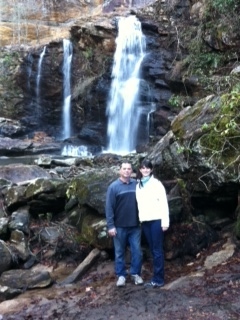 We also want to explore the amazing hikes and natural wonders of the Western North Carolina Mountains. I spend too much of my day hunched over a keyboard–I need to get outside! My mom, Maggie J, is a guest blogger and photographer for the blog.